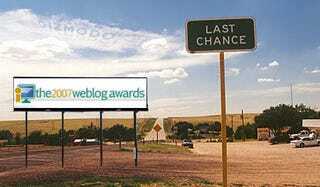 Loyal Gizmodians, this is your last chance to vote for Gizmodo for Best Technology Blog in the 2007 Weblog Awards. The polls close today (November 8th) at 5:00 p.m. Eastern Time (that's 2 p.m. Pacific). You can vote once every 24 hours, so please support Gizmodo for Best Technology Blog. Thanks to all who voted for us, and if you haven't voted yet, please don't cheat because those votes will be disqualified. Final Update: There was a jump of 1000 votes for another tech blog in the last 20 minutes of balloting, and we fell behind by 150 votes in the final stretch. So Close! Anyhow again, thanks for voting.